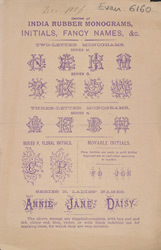 Among other things, Indian ink rubber stamps such as those advertised here would have been used to mark laundry items. Wealthy families with large houses often had private laundry rooms, and individual items of washing were carefully recorded so that it could be returned to the correct owner or stored in the appropriate cupboard. Smaller households sent their clothes to a public laundry via a washerwoman, who would clean them and return them washed and ironed. Again, stamps were used to ensure that garments could not be lost or sent to the wrong family.